1000's of classic car products to choose from including t-shirts, DVDs, books, workshop manuals, classic car engine parts, nostalgic advertising posters, metal signs and much more. A profile of Classiccarproducts.co.uk was found on the social network Facebook. The web server used by Classiccarproducts.co.uk is located near the city of Wilmington, USA and is run by E.I. du Pont de Nemours and Co.. 11 other websites are located on this web server. Most of them are provided in the english language. 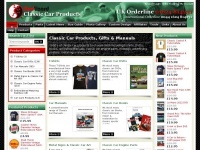 The websites of Classiccarproducts.co.uk are served by a Apache server. The markup language of the website is XHTML 1.0 Transitional. The visitor analysis software Google Analytics is used to analyze the visitors of the websites. The website does not specify details about the inclusion of its content in search engines. For this reason the content will be included by search engines.